As many women will be reaching into the wardrobe for their trusty sequinned party dress, the red carpet has other ideas, as celebrities have been embracing all things froofy and princessy. And they’re showing that there’s no need to be scared of looking “girly” –in fact, it’s something to be celebrated. 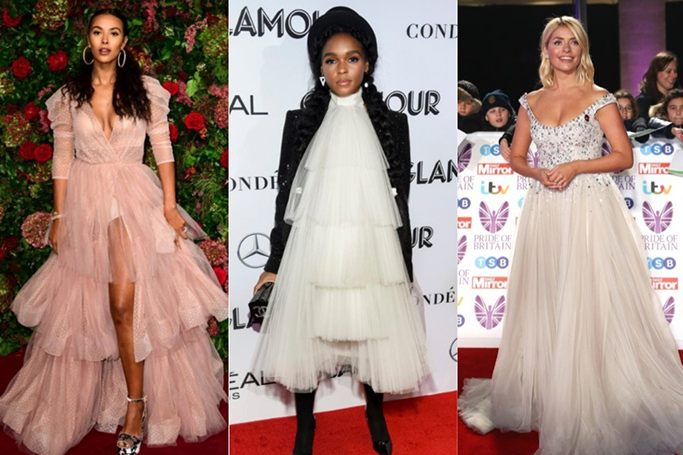 From full princess –Gwen Stefani in Reem Acra style—to the flip-side of the trend with a gothic twist on tulle, A-listers are showing us how to wear the festive trend. Sunday saw the Evening Standard Theatre Awards in London, and presenter Maya Jama went full princess in her pale pink tiered gown. Jama wasn’t the only celeb championing tulle on Sunday evening, as Lady Kitty Spencer styled this gothic number. These two looks from the same event demonstrate how differently tulle can be styled. Meanwhile, model Maddi Waterhouse, wore a pale pink dress by Ryan Lo to the UK premiere of Fantastic Beasts last week. While TV favourite Holly Willoughby sported a gorgeous princess Jenny Packham tulle gown to the Pride of Britain awards. If pale pinks and romantic vibes aren’t exactly your thing, look no further than Busy Philipps for inspiration. She went to last week’s People’s Choice Awards in a Christian Siriano dress that really brought the witchy drama. Bonus points for her wearing floral Doc Martens with the gown, which must have been a welcome break from achingly high heels. Or what about singer Janelle Monae at last week’s Glamour Awards. White tulle could veer dangerously into bridal territory, but Monae kept well away from this with an edgy black jacket and hat. It’s perhaps unsurprising we’re seeing such an increase in tulle on the red carpet. Why? Because of Giambattista Valli, the Italian fashion designer who has been slowly and steadily winning celebs over with his froof-tastic designs. More definitely is more when it comes to Valli – think ginormous clouds of tulle dresses in all colours of the rainbow, worn by everyone from Julia Roberts and Lady Gaga to influencer Chiara Ferragni (who has an impressive 15.5m followers on Instagram). Where the red carpet goes, it’s safe to say we will follow. Now is the time of year when we start gearing up for party season, and we’re keeping a beady eye out for sartorial inspiration. Experimenting in a bit more tulle is the most on-trend fashion choice you could make this year.